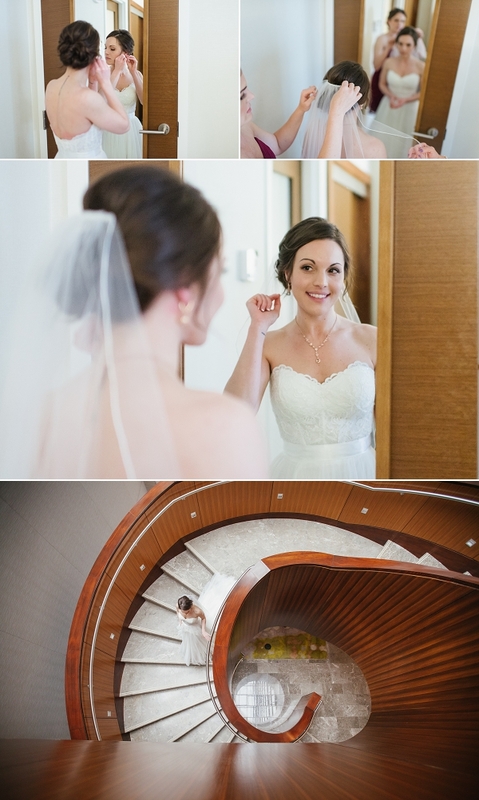 Rachel and Andrew had a stunning spring wedding, with some awesomely memorable moments in tow. While Rachel was just about to put her dress on, the fire alarms at the Hilton Downtown Columbus went off. Everyone was evacuated to the lobby. Luckily, Rachel’s mother brought the champagne and there were fire drill cheers in the lobby to pass the time, as well as views of very handsome firemen (but that’s neither here nor there- just thought it was worth noting lol). After about 15 minutes, all was cleared and they were allowed to go back to their room. Best part about it, we were still on schedule! Rachel was an absolute dream in her LaJeune Mariee dress. It was soft and flowy, and she reminded me of the most elegant ballerina. The entire wedding took place at the Franklin Park Conservatory on the most perfect of days in late April. They did a first look in a side garden that could have rivaled any Tulip farms in Holland. Ironically, the tulip colors were the same colors of the wedding party, so to say it was meant to be was an understatement. Bursts of wind made for the cutest facial expressions when Rachel’s veil was blown up.